Plums are absolutely delicious and can be included in most beverages, appetizers, salads and desserts. They are especially tasty grilled, sautéed, poached, baked or broiled. You can also swap them out for other fruits such as peaches, nectarines, cherries and apricots in many recipes. 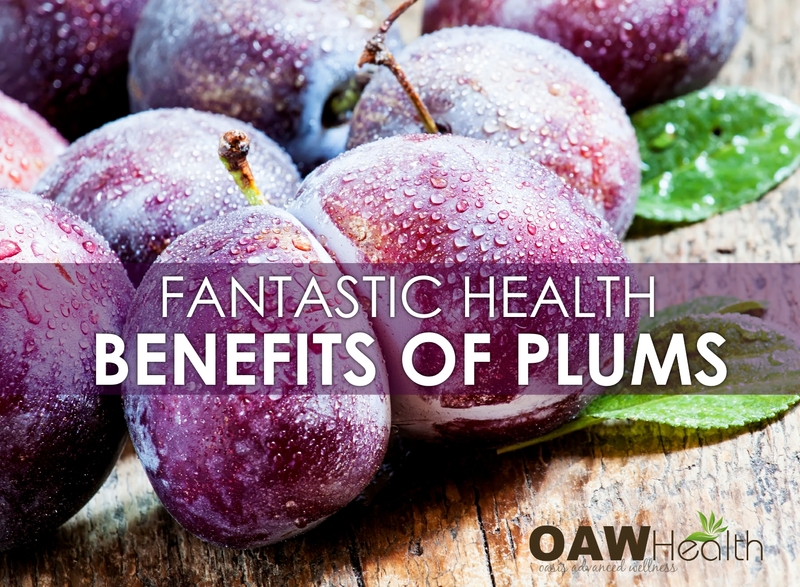 The health benefits of plums are many from helping the body to absorb iron to supporting a healthy digestive tract function. Plum harvesting season extends from May through October with the Japanese varieties arriving first on the market from May and peaking in August. European varieties are harvested in the Fall. This makes plums a great summertime and early fall fruit to incorporate in deserts, smoothies and straight from the fridge. Plums (fresh version) and prunes (dried version) are scientifically known as Prunus domestica. 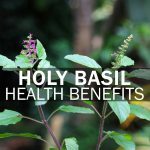 They have been the subject of repeated health research for their high content of unique phytonutrients called neochlorogenic and chlorogenic acid. 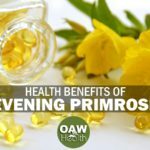 These substances found in plums and prunes are classified as phenols, and their function as antioxidants has been well-documented. Both substances are particularly effective in neutralizing a particularly dangerous oxygen radical called superoxide anion radical, and they have also been shown to help prevent oxygen-based damage to fats. Since cell membranes, brain cells and molecules such as cholesterol are largely composed of fats, preventing free radical damage to fats is no small benefit. 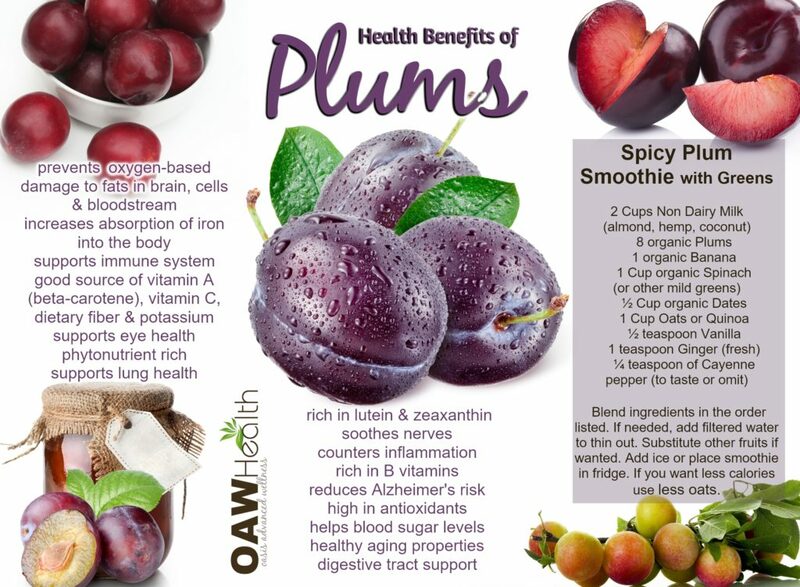 Critical Reviews in Food and Science Nutrition published a paper in 2013 suggesting that snacking on dried plums may increase satiety and reduce the subsequent intake of food, helping to control obesity, diabetes and related cardiovascular diseases. Even though dried plums taste very sweet, it’s interesting to note they do not cause a huge rise in blood glucose and insulin after meals. Dried plums also have a positive affect in the gastrointestinal tract by preventing constipation and maybe even colon cancer. The bioactive compounds in dried plums, as well as their metabolites, can also act like antibacterial agents in the gastrointestinal and the urinary tracts. Blend ingredients in the order listed. If needed add purified water to thin out. Substitute any of the ingredients for what you may have on-hand. 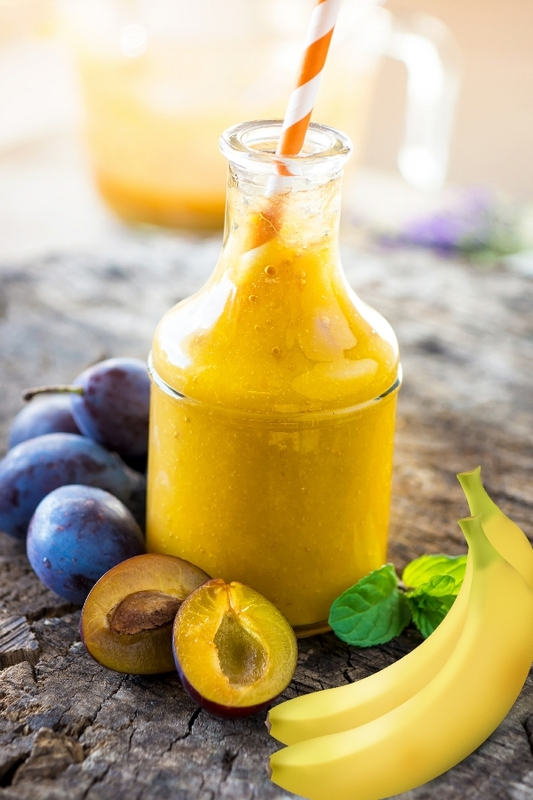 If smoothie is too warm cool down in fridge, add some ice of pre-freeze banana. If you want less calories, use less oats. Enjoy!